It’s so funny how after being addicted to something for 3 weeks, how much of an effect it can actually have on you! This is what it was like for me with the Tour De France. I will admit, I never followed it this religiously in the past years but this year I’ve just got completely hooked. 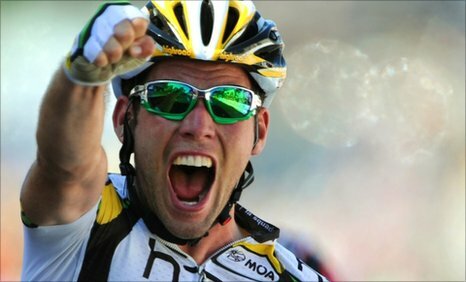 I even burst into tears when Brit Mark Cavendish and his team HTC Highroad won the green jersey. The funny thing is though is that I’m now left with this feeling that I need to buy a road bike and go cycling round the Brecon Beacon mountains wearing pink lycra and riding in the slipstream of some stampeding sheep. Ask yourself how many activities in this world are as powerful and inspiring as sport itself. How many activities, once you’ve seen them at their best, make you actually want to involve it in your life for the rest of your existance? This can happen to anyone, and I am living proof. All it takes is a sporting epiphany. Pre-2005 you couldn’t have paid me to watch cricket. All it took was one one good match to get me completely hooked. 6 years on, I’ve published an eBook explaining the sport, become a frequent cricket blogger, visited at least 7 different county grounds throughout the UK, commentated on an international test match online, interviewed players and coaches and often tweet match updates to nearly 600 followers. Sport can create passion and constantly fuel it every time you watch or play it so it never dies. Sport can bring the most unlikely of characters together from opposite sides of the world. It can reduce a grown man to tears. It can be enjoyed by people of all ages and it’s history never dies. Sport unites, excites and inspires, and we should encourage as many people as we can to get involved, be it supporting, watching or playing. It can have one hell of a result. I like to call it The Sport Effect.